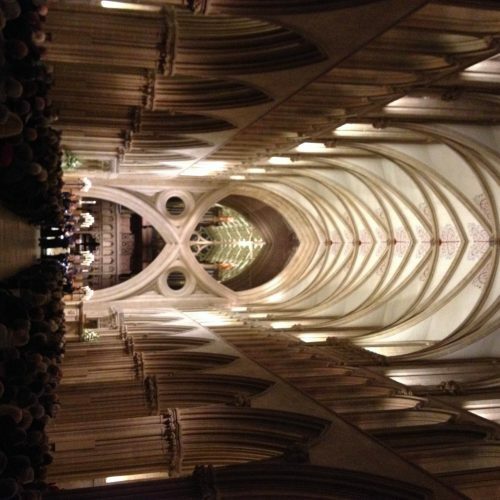 This month got off to the most wonderful start with a concert in one of England’s most beautiful Cathedrals, Wells. A packed Nave meant the choir had to begin the concert standing right against the West Door but the acoustic is such that we became instantly aware that our sound was pinging down the Cathedral without us having to do very much at all! A dear old friend and colleague, well, maestro to me, Barry Rose was there to listen to the rehearsal. The very first LP I heard of a men and boys choir was Guildford Cathedral choir directed by none other than Barry. Even at the age of 6 I was captivated by the beauty of their sound and the clarity of the diction. Nearly 50 years later, and I know I’ll probably cheese lots of people off by saying this, I’m not sure I’ve ever heard a recording to rival it. I sang with the BBC Singers many times, often under the baton of Barry, and clearly remember his attention to detail with text, especially dipthongs. He always wanted to hear them, rather than singers ignore them and this is something I try to emulate with Tenebrae all these years later! Anyway, I digress. The concert was a joy to perform and it was especially rewarding to see so many people also supporting the Somerset Community Foundation, for whom the concert was in aid of. Next in the diary is something I’ve been looking forward to for a very long time: a recording of works by Polish composer Pawel Lukaszewski. I think Tenebrae was one of the very first British choirs to record anything by Pawel back in 2005, a gorgeous motet Ave Maria, on what has turned out to be one of our best selling discs Allegri: Miserere. Pawel’s star has risen considerably since then and his music has continued to develop and truly glow as some of the finest choral music being written in the 21st century. Immediately after the sessions we look forward to returning to the wonderfully peaceful atmosphere of Douai Abbey for a performance of our Russian Treasures programme. There’s something very special about the Abbey in that once there I find it easy to lose myself in the music and not be distracted by external or more worldly concerns! No rest for the wicked however as we race off even further west to Dorchester (Dorset) the next day for more Russian delights at a new venue for us, Holy Trinity RC Church. It’s safe to say I’ve had a lovely morning writing this in the Tenebrae Office, and who better to bring in for a quick visit than my old friend, Monty. He worked so hard helping me write this, he tired himself out!